KingBurg is an advanced fast food template. The design is made in a creative style. In the control panel, the template has absolutely everything for setup: the mega menu builder, live theme editor for real-time layout setup, the function for creating and compressing CSS3 files, and so on. There are also various advertising banners. If you want to open as soon as possible, you can use one of the ready-made demo sites. With the help of a convenient search and filtering system, your potential customers will be able to find what they need in a matter of minutes. Menu can be displayed as a list or a grid. With built-in quick preview. Special products can be represented using the slider plugin. Bootstrap enables you to make better websites faster and easier. Responsive layouts adapt to smaller and also large display dimensions mechanically. Considering the growing popularity of smartphones, the quantity of individuals who log on to the internet sites from mobile phones has increased significantly. Such a aspect lets you adjust websites to cellular devices and various screen extensions, ultimately supplying cellphone users with better opportunities. In what cases I don't need the extended license for OpenCart ecommerce templates for Food & Restaurant Rewies? What is a one time usage license for a Cafe and Restaurant Supplies OpenCart design theme? When you buy the Cafe and Restaurant Supplies OpenCart design theme at usual price you automatically get the one time usage license. It enables you to use each individual product on a single website only, belonging to either you or your client. You have to purchase the same template again if you plan to use the same design in connection with another or other projects. When passing files to your client please delete the template files from your computer. Can I resell OpenCart ecommerce themes for Fast Casual Restaurant I bought the developers license for? You cannot resell the customized Fast Food Delivery OpenCart design as a template, but you may sell it as a project to your client. Is it possible to buy the particular image from the OpenCart design theme for Fast Casual Restaurant? No. According to our Terms and Conditions we never sell the images separately from Food & Restaurant News OpenCart design themes (as well as the templates separately from the images). I would like to make payment for OpenCart ecommerce theme for Cafe and Restaurant Supplies by company check. Is that possible? Please use Skrill payment option. They accept payments by check.You can place an order for OpenCart ecommerce theme for Cafe and Restaurant Supplies on the site under the name of the company and choose Skrill merchant system for making payment from the company's account. To initiate bank transfer, please create an account here - www.skrill.com, add the number of your bank account and verify it. After that, you can place an order on our website and choose Skrill on checkout page. When the payment is made, the product will be sent to your e-mail along with the invoice under the name of your company. Will you help me to customize my Cafe and Restaurant OpenCart design? We do not provide any help or instructions on Cafe and Restaurant OpenCart design customization except for www.template-help.com help center. If you are not sure you can customize the template yourself we recommend to hire a design studio to customize the template for you. Can I resell the customized OpenCart theme for Food & Restaurant Magazine? No, you cannot resell the customized OpenCart theme for Food & Restaurant Magazine as a template but you may sell it as a project to your client (see paragraph 1 ONE TIME USAGE LICENSE for more details). Can I resell the Fast Food Drive Through OpenCart design themes I bought the extended license for? No, you cannot resell the Fast Food Drive Through OpenCart design themes as is. You can only sell them as the integral part of your new product. Will TemplateMonster help me to install my OpenCart ecommerce template for Cafe and Restaurant? Some of our products like osCommerce templates, Zen Cart templates, etc. require installation to operate. Installation services are not included in the package price. TemplateMonster though offers you a variety of sources to help you with installation of your OpenCart ecommerce template for Cafe and Restaurant including installation instructions, some articles with our Online Help Center. Our Knowledgebase contains customers questions and most frequent problems. Anyway, you can always refer to our partners from TemplateTuning.com to install your OpenCart ecommerce template for Cafe and Restaurant for you for a small fee. Make sure that these charges for Food & Restaurant Services OpenCart design have different order IDs. If it is so, contact our billing department. Are there any restrictions for using imagery, cliparts and fonts from the Restaurant OpenCart ecommerce template I purchased? All imagery, clipart and fonts used in Restaurant OpenCart ecommerce template are royalty-free, if not stated otherwise on the product page, and are the integral part of our products. One Time Usage License and Developers License give you the right to use images, clipart and fonts only as a part of the website you build using your template. You can use imagery, clipart and fonts to develop one project only. Any kind of separate usage or distribution is strictly prohibited. What is Developers License for Fast Food Chain OpenCart ecommerce theme? If you purchase a Developer's license, you are granted a non-exclusive permission to use the Fast Food Chain OpenCart ecommerce theme on up to 5 domains for projects belonging to either you or your client. 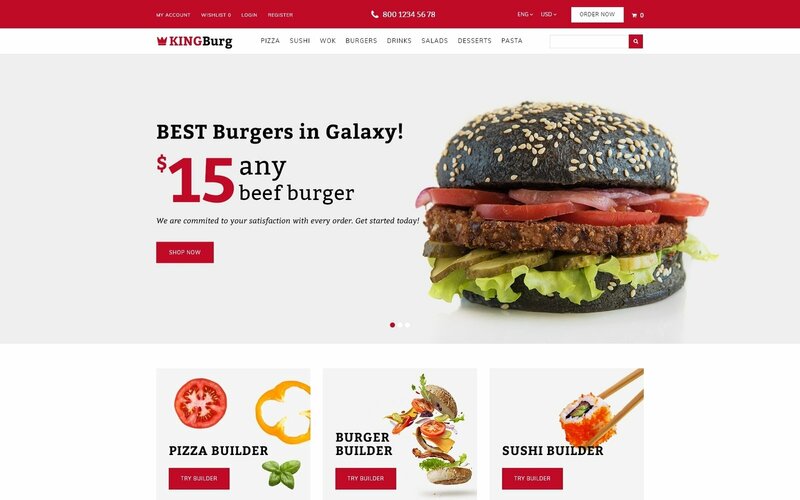 Is it possible to use your OpenCart design themes for Fast Food Restaurant Supplier to develop websites for my customers? Yes. It is perfect for designers who want to offer their customers a high-quality design and also save time and money. Keep in mind that when you purchase the OpenCart ecommerce template for Quick Service Restaurant with ordinary or exclusive license you're entitled to create only one project (one domain name). I have customized the OpenCart ecommerce template for Quick Service Restaurant and would like to protect my content by copyright, can I place Copyright, Mycompanyname.com? After OpenCart ecommerce template for Quick Service Restaurant purchase you can put your copyright to the template. But you cannot place a line at the bottom (or any other spot) of the customized project saying "Website design by Company name". Nevertheless, you can place "Customized by Company name". Can I integrate the OpenCart ecommerce template for Food with third-party software or applications for development of my new products? No, you cannot get the developers license for development of OpenCart ecommerce template for Food or other products. I ordered a Food OpenCart template but haven't received the download information. In case of not receiving the download information of a Food OpenCart template, please contact our Billing Department via support chat by phone or e-mail. Can I customize the OpenCart template for Fast Food Restaurant Equipment and Supplies? Yes, you can customize the OpenCart template for Fast Food Restaurant Equipment and Supplies to any extent needed. You cannot use a header of the template for one project though, and images from the template for the other project. Can I apply a discount code to a discounted OpenCart ecommerce template for Quick Service Restaurant or combine several discount codes together to get better price? Can I customize the Food OpenCart template if that's required by application settings? Yes, you can customize the Food OpenCart template code, graphics, fonts to any extent needed. What is the difference between unique and non-unique OpenCart template for Food & Restaurant purchase? Non-unique purchase:Non-exclusive purchase means that other people can buy the OpenCart template for Food & Restaurant you have chosen some time later. Unique purchase:Exclusive purchase guarantees that you are the last person to buy this template. After an exclusive purchase occurs the template is being permanently removed from the sales directory and will never be available to other customers again. Only you and people who bought the template before you will own it. How many applications, programs etc can I use to integrate with the Food & Restaurant OpenCart ecommerce themes under one extended license? The extended license gives you the right to use the purchased Food & Restaurant OpenCart ecommerce themes for the integration with one software/freeware/application/CMS/sitebuilder only. In case you would like to use the template with the other application, the other license is to be acquired. What am I allowed and not allowed to do with the OpenCart templates for Fast Food Drive Through? You may: Build a website using the OpenCart ecommerce template for Cafe and Restaurant in any way you like.You may not:Resell or redistribute templates (like we do).Claim intellectual or exclusive ownership to any of our products, modified or unmodified. All products are property of content providing companies and individuals.Make more than one project using the same template (you have to purchase the same template once more in order to make another project with the same design). Can I get the extended license for some other pricing than the half of the initial OpenCart ecommerce template for Cafe and Restaurant Equipment price? No. The price for purchasing license for a single OpenCart ecommerce template for Cafe and Restaurant Equipment is the half of the template unique price. Can I contact the Fast Food Drive Through OpenCart theme author? Yes. You can contact this Fast Food Drive Through OpenCart theme author/author's team directly using your personal account under the Support tab. Professional! Unique theme and unique service. The template makes our web site simple, pretty and professional. We requested for minor customization on this theme. Thanks to the customer service team for their professionalism, knowledge and patience, who helped smoothen our concerns and work out the solution in a timely manner. Your efforts into providing top-notch web design and tech support is much appreciated.